Item H on the agenda for the Nov. 17 meeting of the Board of Education is titled “Final Review of Request for Division-Level Review for Richmond City Public Schools.” It recites a request from the Richmond School Board for a division-level review of the Richmond system. The Superintendent of Public Instruction recommends that the Virginia Board of Education approve the Request for Division-Level Review for Richmond City Public Schools. 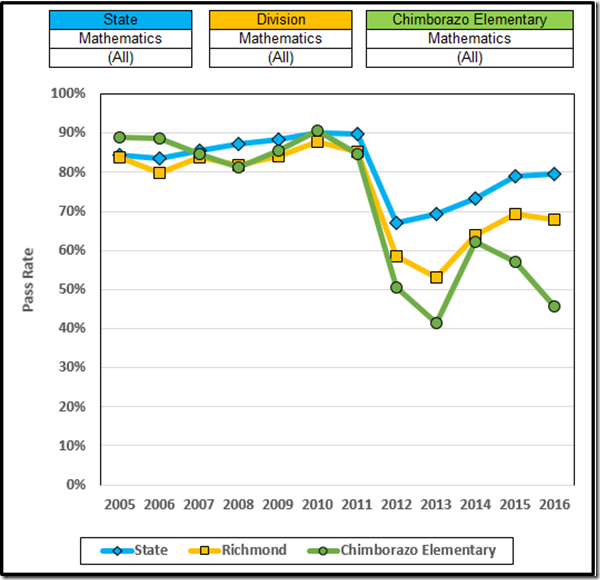 The request for Division-Level Review for Richmond City Public Schools supports accountability for student learning. 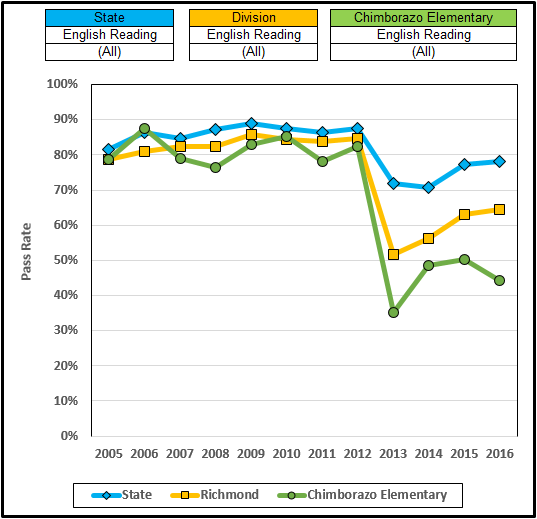 Results of the review will be used to develop a division-level Memorandum of Understanding and Corrective Action Plan which will support improvement in the academic performance of students in Richmond City Public Schools. § 22.1-253.13:3. Standard 3. Accreditation, other standards, assessments, and releases from state regulations. When the Board of Education determines through the school academic review process that the failure of schools within a division to achieve full accreditation status is related to division-level failure to implement the Standards of Quality or other division-level action or inaction, the Board may require a division-level academic review. After the conduct of such review and within the time specified by the Board of Education, each school board shall submit to the Board for approval a corrective action plan, consistent with criteria established by the Board setting forth specific actions and a schedule designed to ensure that schools within its school division achieve full accreditation status. That’s clear enough: The prerequisite to a division-level academic review is a “determin[ation].” No determination, no authority to conduct a division-level review. The agenda item, notably the recommendation, is silent as to the required determination of “division-level failure to implement the Standards of Quality or other division-level action or inaction” leading to failure to receive full accreditation. The Board thus is proposing to strike out into ultra vires (that’s Latin for “lawsuit bait”) territory. As well, the Superintendent’s rationale is silent as to facts that would support a determination of such division-level failure or action or inaction. It mentions only that the Richmond request “supports accountability for student learning” (whatever that means) and will lead to a “Plan.” So the Board’s paperwork also fails to state the factual prerequisite for the required finding. In this respect, the rationale ignores the attachments that show only a third of the Richmond schools fully accredited). 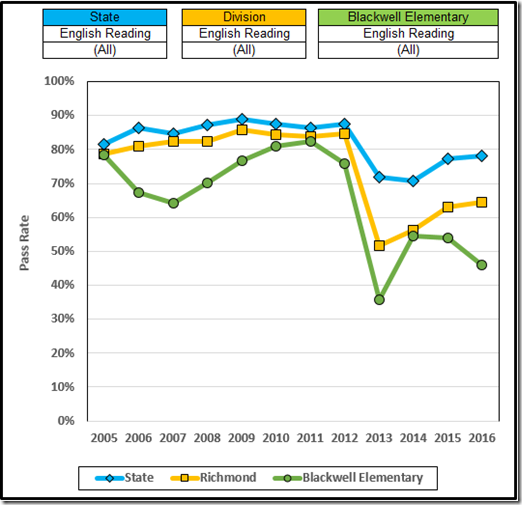 Finally, and most important to the schoolchildren of Richmond, the Board’s paperwork asserts only that the resulting Plan will “support” academic improvement but not that it will produce improvement or lead to accreditation. This Board of “Education” is so unsure of its own capability that it is unable to assert that its intervention will do any good. Unfortunately, that timidity is well founded. The Board has been conducting futile “academic reviews” of the Petersburg system since at least 2004 with the result that only two of six Petersburg schools are fully accredited. Indeed, the Board members admit (Sept. 21, 2016 video starting at 1:48) that they don’t know how to fix bad schools. 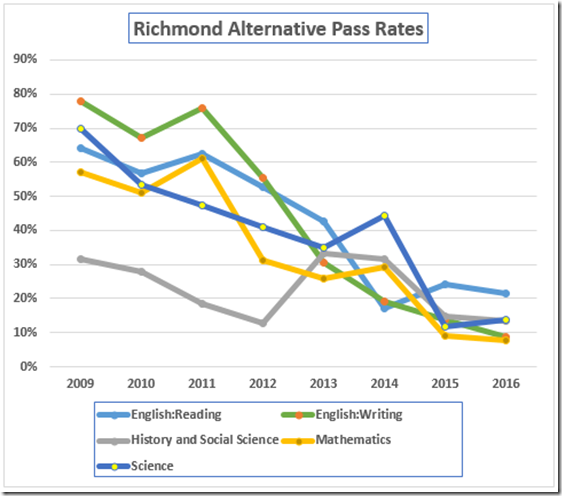 For observance of the requirement of § 22.1-253.13:3 and for clarity and completeness of its paperwork and for the effectiveness of its academic review process, the Board of Education gets an F.
We’ve already seen the applications for “reconstituted” status of Woodville, the worst performer of the twelve Richmond applicants this year, and Blackwell, the second worst. Both of those posts set out the background on the reconstitution process. Next up: Third worst, Chimborazo. The “All” entries refer to the tests on the selected subject. In these graphs, it means grades 3-5 for reading and math, grades 3 & 5 for science. 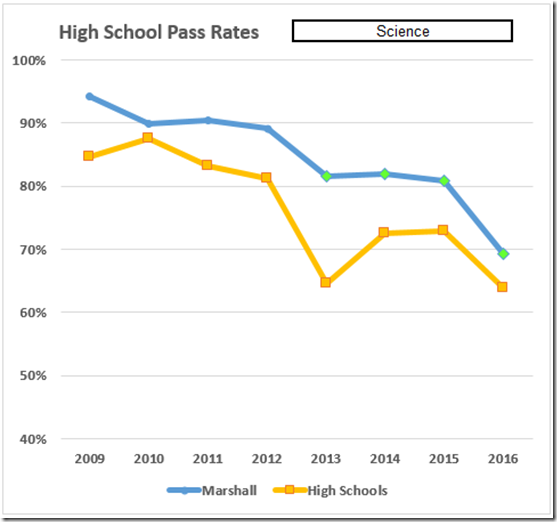 These data are pass rates, not the inflated accreditation rates. Chimborazo has been a Focus School since 2015. Fat lot of good that did. The application [Item F] tells us that Chimborazo is a Title I school with no English language learners and 61 of 416 (15%) Special Ed students. The application is blank at the “Free/Reduced Lunch Eligible Percentage.” VDOE tells us that this school’s student population is 83% economically disadvantaged. We know that academic performance decreases with increasing poverty. But 83% ED does not tell the whole story. 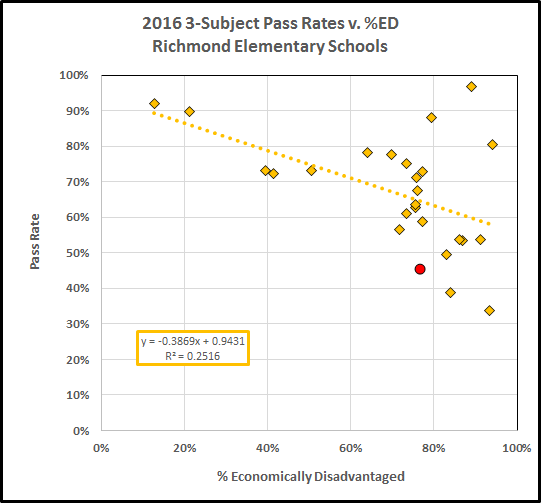 Chimborazo, the red circle on this graph, considerably underperforms other Richmond schools with similar or more challenging populations. 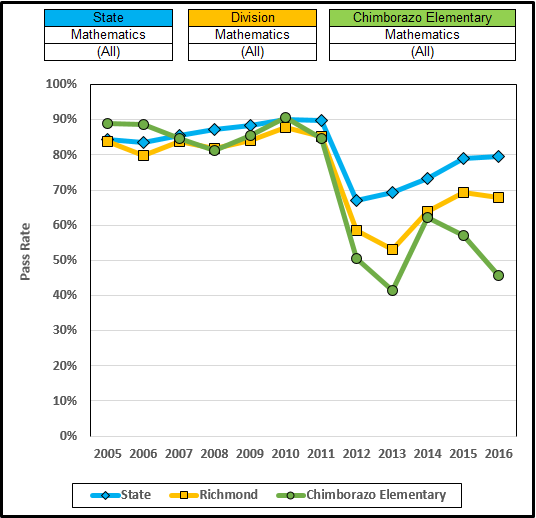 Moreover, notice above that Chimborazo gets nearly state average science pass rates from the same students who suffer miserable pass rates in reading and math. The difference between science and reading/math can’t be the students; it must be the teaching. 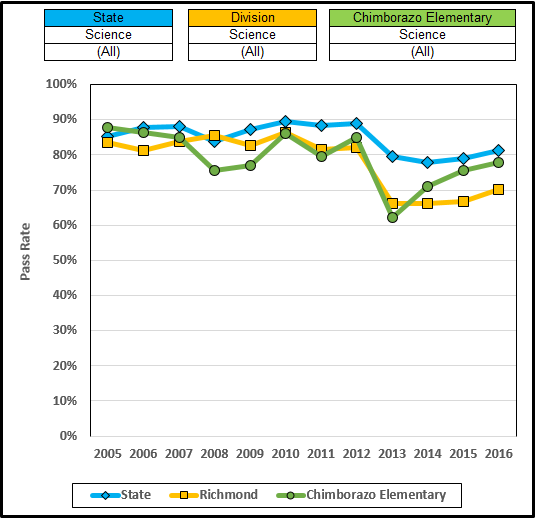 As we saw earlier, the (former) Principal at Chimborazo rated six teachers (15% of 39) as Exemplary, twenty-eight (72%) as Proficient, four (10%) as Needs Improvement, and one (2.6%) as Unacceptable. Yet, with all those purportedly fine teachers, Chimborazo’s subject average pass rate was the 26th worst (of 1715) in the state. 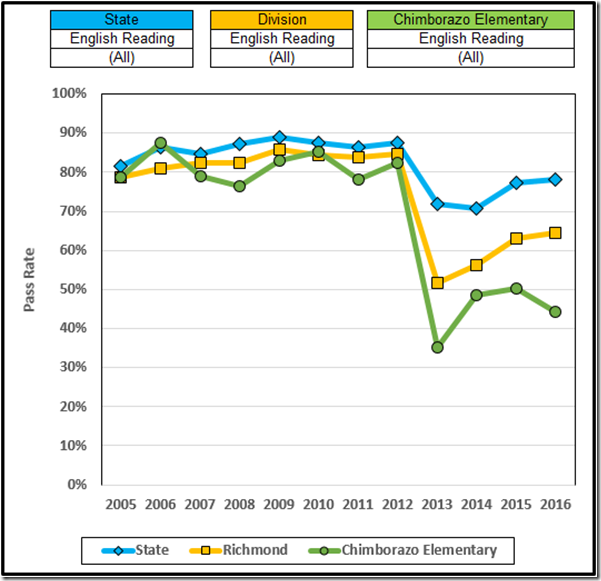 The Chimborazo application proposes reconstitution in Governance, Instructional Program, and Staff. Governance: Chimborazo will have a new Principal and Assistant. They do not tell us whether the departures of the incumbents were forced or adventitious. As to what these new bureaucrats will actually do, they say only: “New principal and new assistant principal to present new ideas and relationship building activities to assist teachers and students with bonding.” There’s no mention there of rigor, or evaluation, or accountability. There will be two teachers, one an eleven month employee, acting as IB coordinators and providing “intense” teacher training. There is no discussion of the place of the IB program at a school that can’t teach its students to read. Instructional Program: Currently the teachers handle all subjects, K-5. The school will “departmentalize” teams in grades 3-5 “to allow teachers to focus on specific subject matter.” Nice jargon; wonder what it means. Collaborative planning will be doubled from one to two days per week at all grade levels. “All grade levels will move toward co-taught classrooms and away from the self-contained model for students with special education needs.” Whatever that means. Staff: All new teachers will be mentored. Family Engagement: The application contains a page and a half of family activities but no information as to how the families will be enticed to participate. 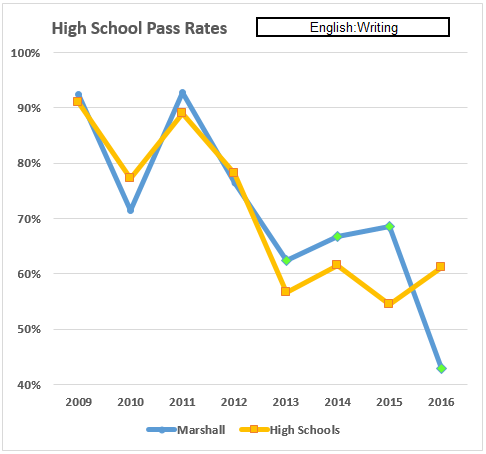 Then, without any further explanation, the Trajectory of Progress shows English and History scores improving to the accreditation minima by 2019 but the math score increasing only to 61, which is nine points short. So, entirely aside from the jargon, the occasional statement that does not make sense, the lack of any explanation as to how the proposed changes will produce the trajectory of increasing scores, and the absence of any kind of accountability, Chimborazo proposes to “reconstitute” in order to remain unaccredited. This reminds us of Woodville’s plan to not be accredited and Blackwell’s better but wholly nonspecific plan. And this “plan” is the twin of those plans in its failure to hold anybody accountable for anything. The level of fecklessness in this application (as with the astounding level in the Woodville application and the lesser but still unacceptable level in the Blackwell document) is troublesome, of course. But the involvement of VDOE and the Board of Education in this school improvement theater raises an ugly question: Does the state education bureaucracy not care about the awful performance of these schools or does it not know how to improve that performance? The always helpful Chuck Pyle points out that the Board of Education’s Accountability Committee (a committee of the whole) met on these applications the day before the 9/22 Board meeting. Perhaps that is the “subcommittee” mentioned at the Board meeting. The committee minutes are not yet up but the video of the meeting [click the 9/21 video link] is instructive. 56:20: Intro to the discussion. 1:08: Intro to discussion of schools that did not demonstrate progress. 1:30:40 to 1:32:58: “Discussion” of Blackwell, Chimborazo, Mason, Overby, Westover Hills, Woodville, and TJ. 1:42:35: What is the recourse for the awful decline at Woodville? Following discussion suggests that they will demand an MOU (incorporating a “corrective action plan”) at Woodville; beyond that they do not have an answer. One happy moment at 1:48:18: Dan Gecker makes the only sensible statement: Another MOU won’t change anything; we’ve had thirteen MOUs at Petersburg; we need a systemic approach. THEY DO NOT KNOW HOW TO FIX THESE AWFUL SCHOOLS. 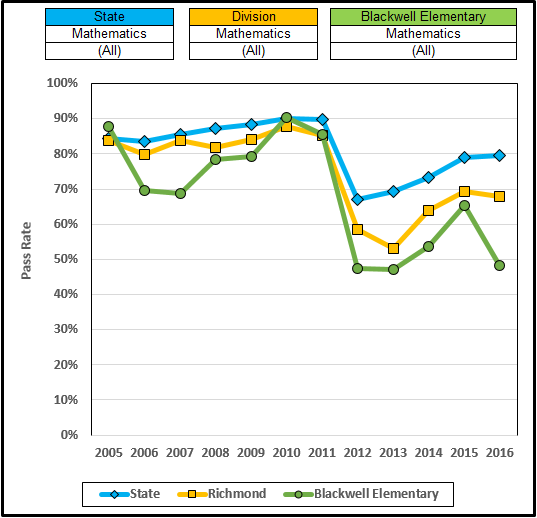 Blackwell had the second-worst performance among the twelve Richmond schools that flunked accreditation for a third year running and applied for “reconstituted” status. 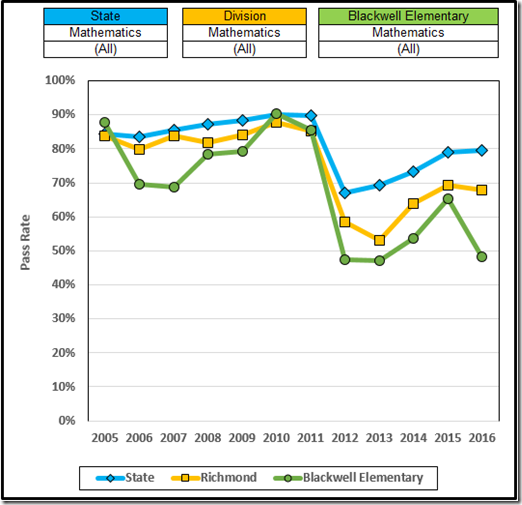 Blackwell missed accreditation in Reading, Math, and Science. 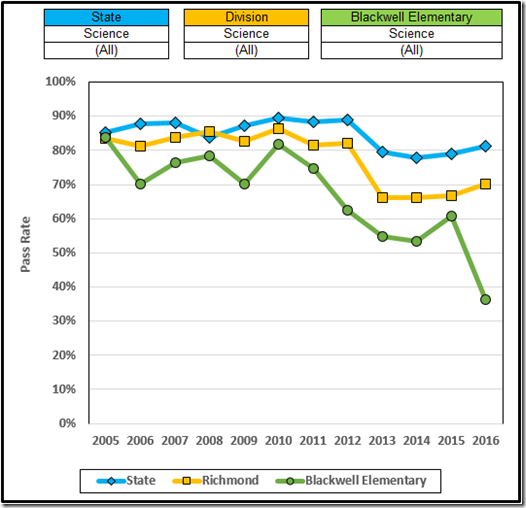 Blackwell also had the 17th lowest pass rate of 1715 Virginia schools. The “All” entries refer to the tests on the selected subject. In the graph above, it indicates reading at all the elementary grades tested, i.e., 3-5. 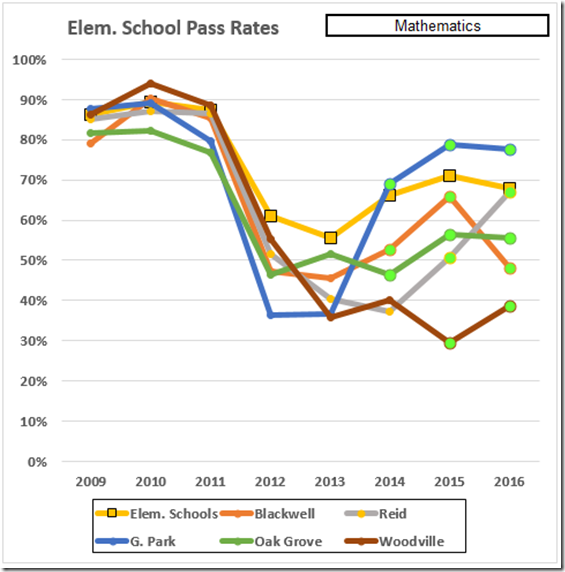 Blackwell has been a focus school since 2014. Fat lot of good that did. [A] local school board may choose to reconstitute a school rated Accreditation Denied and apply to the Board of Education for a rating of Partially Accredited: Reconstituted School. The application shall outline specific responses that address all areas of deficiency that resulted in the Accreditation Denied rating . . . The VDOE database contradicts the Free/Reduced number; it reports an economically disadvantaged total of 77%. Given that students receiving Free/Reduced Meals are included in the ED count, we can be sure that one of these numbers is wrong. See the note below regarding that 77% (or, perhaps, 100%). 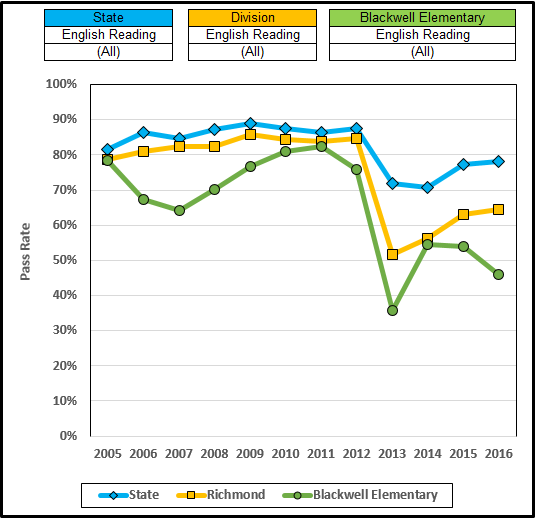 As we saw earlier, 97% of the Blackwell teachers were rated “proficient” and only one (2.6%) “needs improvement” in 2016. 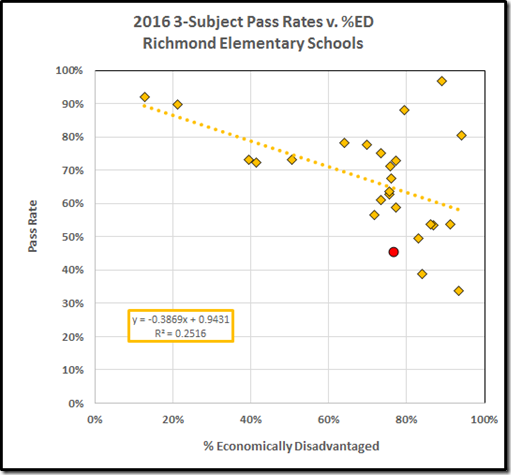 This school produced the third worst overall elementary school pass rate in Richmond (which had the lowest overall rate in Virginia) but the Principal (former Principal, thankfully) reports that all but one of the teachers did just fine, thank you. The application proposes reconstruction in the areas of Governance, Instructional Program, Staff, and Student Population. Yet the application discusses only two of these: Instructional Program and Staff. They don’t tell us what “fidelity” means in this context. 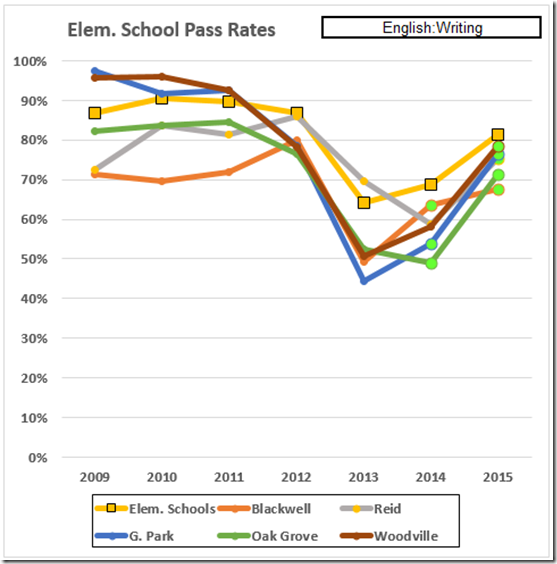 Given that Woodville proposes exactly the same new “practice,” with exactly the same lack of specificity, this looks to be VDOE jargon, not any kind of proposal for actual improvement. Staff: The Principal has retired and will be replaced. An Assistant Principal also has left and will be replaced. Family Engagement: They will have PTA participation, a monthly calendar of parental involvement, and, every nine weeks, “Literacy and Mathematics Night.” There is no mention of how they will entice parents into these activities. That’s all, folks! They will replace the departed Principal and Assistant; they will have some opportunities for parental participation; they will do more of what they did when failing, but now with “fidelity.” No change in Governance; no change in Student Population: Never mind that they checked both of those boxes on the form. 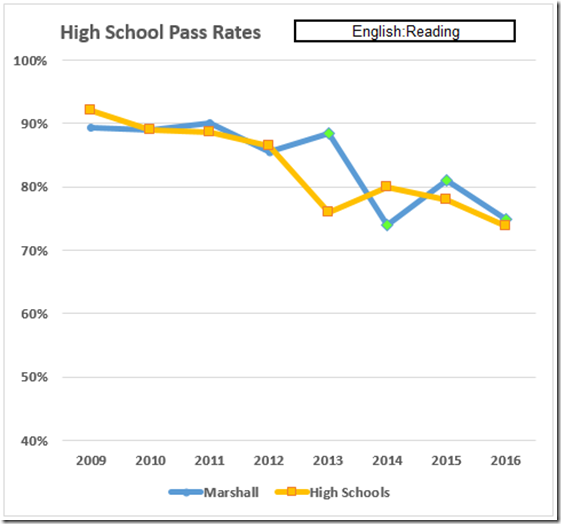 The application does not tell us how this continuation of failed teaching and teachers will improve education at the school; it fails to mention accountability, either in the past or — crucial if this were a serious exercise — going forward. The table also shows an 9 point overall history gain not mentioned in the “Rationale.” The “Reconstitution Information” section of the application is silent as to both history and science so it seems that Blackwell expects the new principal and assistant (or maybe magic?) to produce both that history gain and the 26 point science gain listed in this Trajectory. In contrast to Woodville, Blackwell proposes to achieve accreditation within the three year period. 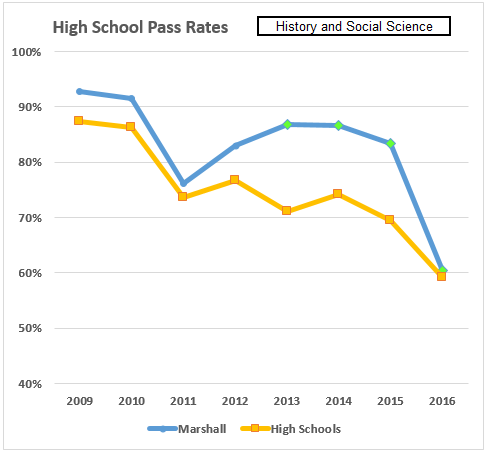 Unfortunately, the school predicts this progress without any analysis and without proposing to do anything significant to interrupt its record of failure and without installing any accountability for its past or future performance. As well, the application neglects to include improvements it promises in the Governance and Student Population areas. In marked contrast to Woodville, the writing in this application is tolerable. It is larded with bureaucratese and it is submerged in the passive voice, but it is capable of being understood, insofar as it actually says anything. In short: This is an exercise in hope, not rigor. A subcommittee (presumably of the Board of Education) reviewed it . The general level of fecklessness in this application (as with the astounding level in the Woodville application) is troublesome, of course. But the involvement of VDOE and Board of Education in this school improvement theater raises an ugly pair of alternatives: Either the state education bureaucracy doesn’t care about the awful performance of these schools or it doesn’t know how to improve that performance. Perhaps we’ll learn more when the Board of Education votes on these applications in October. Surely poverty makes the job more challenging at Blackwell. But poverty is not the explanation for Blackwell’s unacceptable performance. You can stop right there and expect this to be a boondoggle. Sort through all that jargon (“turnaround partner,” “help implement,” “school-improvement model,” “meet state and federal requirements”) and you won’t find a word about helping the kids learn better. To take a look at the results of this designation and process, I’ve pulled the pass rates by subject area for the ten schools in Richmond that have been in Priority status for two years or more. 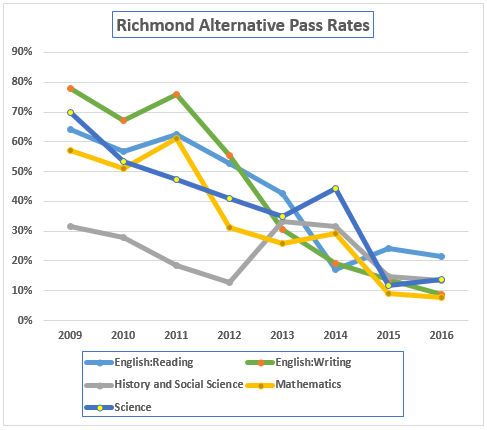 Here, for a start, are the results for Richmond Alternative, which has been in Priority status since 2013. Whatever is going on there (and it can’t be good), Priority status doesn’t look to have helped any. 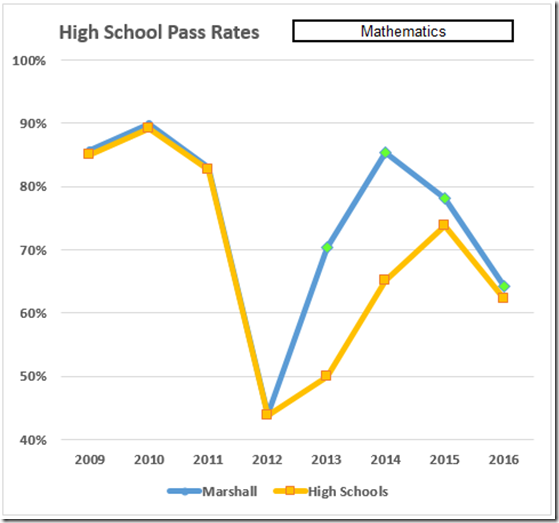 The only high school in Priority status, John Marshall, has been there since 2013. 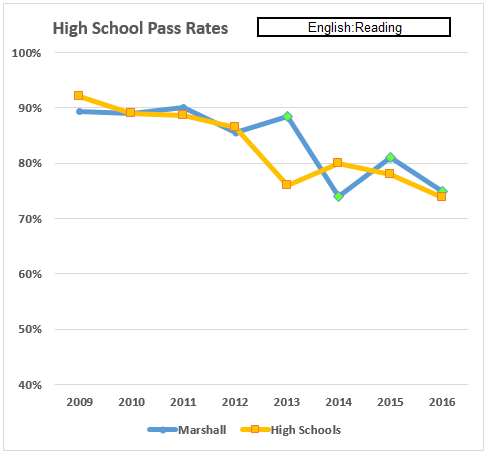 Here, for a start, are the Marshall reading pass rate by year and the average of the mainstream high schools. Note: The “High Schools” average here excludes the selective high schools Open and Community. Also excluded is Franklin Military, which is selective and which includes middle school grades. 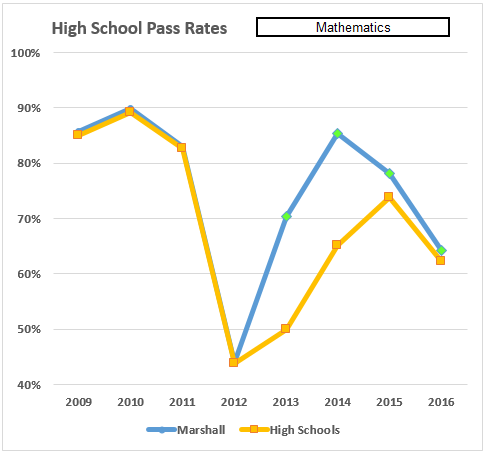 Also note that the high school pass rates are inflated to some extent by inclusion of the Maggie Walker students that live in the relevant districts, albeit those students do not attend these high schools. 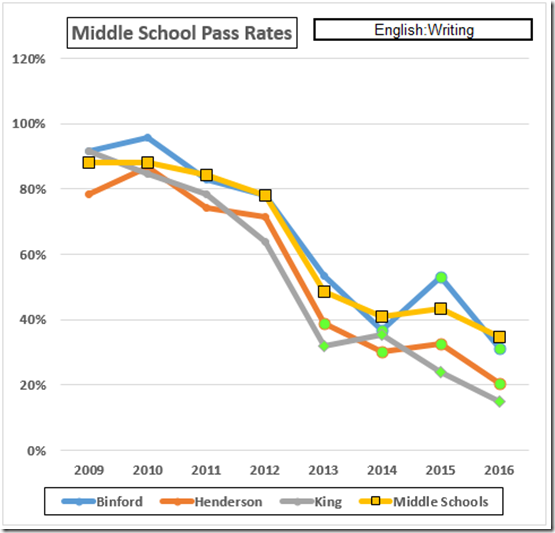 BTW: The nominal cut levels for accreditation in reading and writing are 75%; for all the others, 70%. The green points indicate the years of Priority status. It does not seem to have helped any here. Next, writing, where Priority status looks to have been more associated with failure than success. 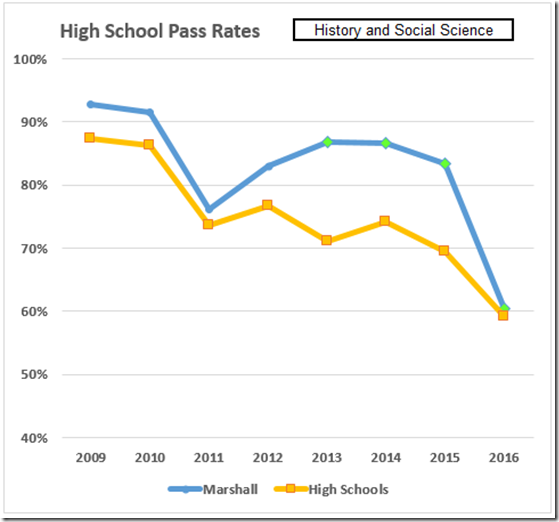 History & Social Science data: More of the same, after an encouraging start. Mathematics, ditto, again after a nice start. 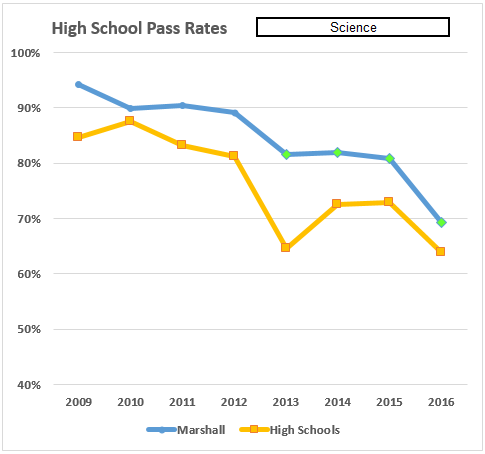 And last, science, where the Priority process again looks to have done more harm than good, dropping Marshall below the accreditation cut line. 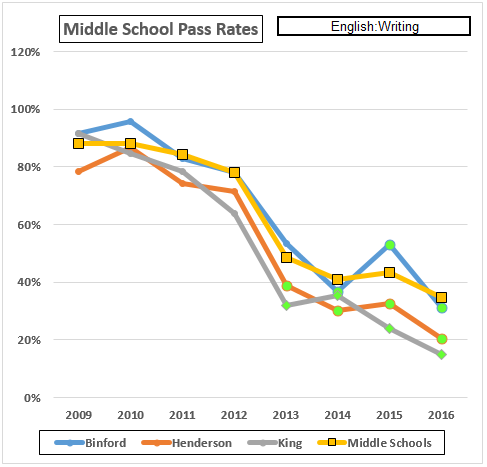 After those pictures of failure, the middle schools at least show some mixed outcomes. First reading. 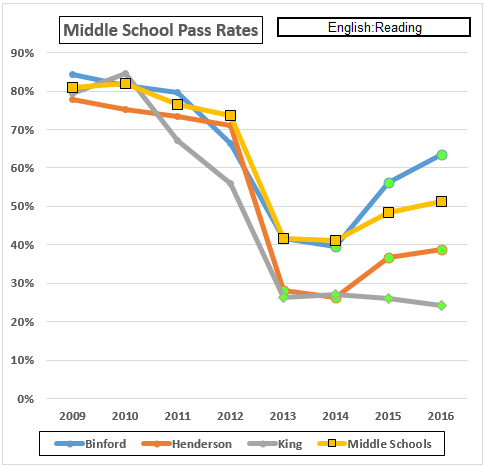 The “Middle Schools” numbers are Richmond averages with Franklin Military excluded. 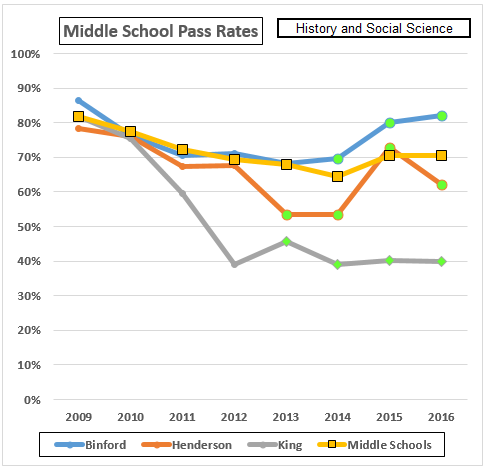 Again, the green points indicate Priority status: Henderson and King since 2013, Binford since 2014. 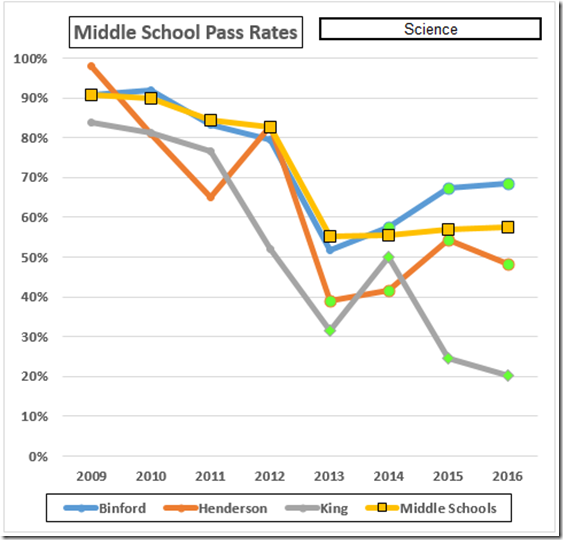 The middle school average is an appalling 51% this year but Binford has improved to a merely bad 64%, and Henderson to an unconscionable, 39%. King, in contrast, has declined slightly to 24%. It’s hard to find a adjective ugly enough to describe King’s condition. As bad as these numbers are, at least we see some progress. The writing scores, however, are uniformly appalling. 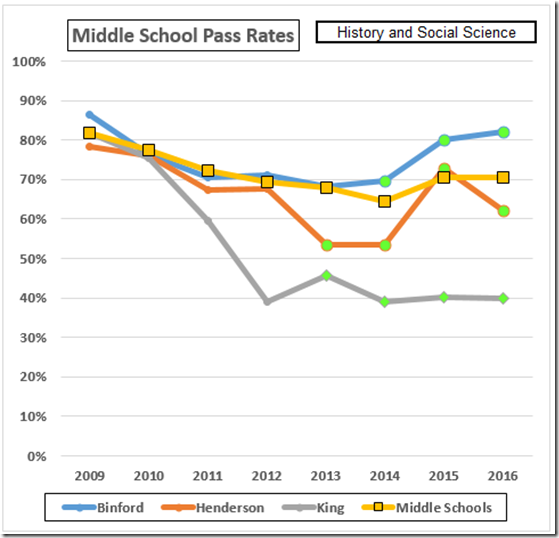 In contrast, history & social science data show a middle school average at the border of accreditation, with Binford improving nicely, Henderson improving overall. MLK again languishes in unspeakable failure. 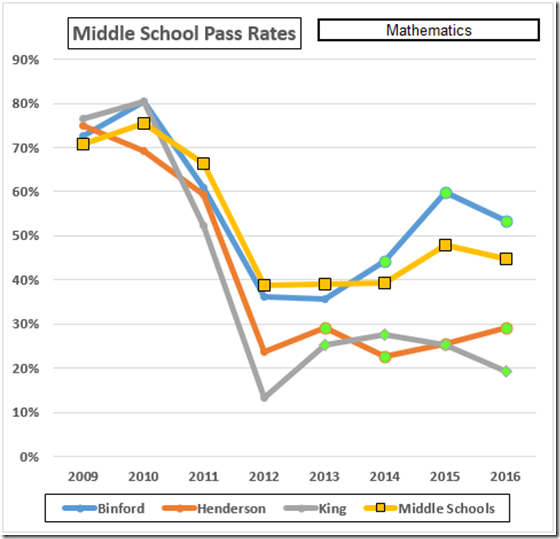 The math scores again are disasters, albeit Binford again shows improvement. 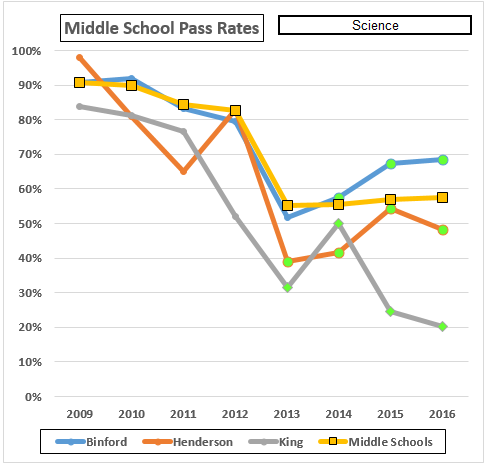 Henderson improves a little and King again declines, with both schools far into Principal firing territory. Finally, science. 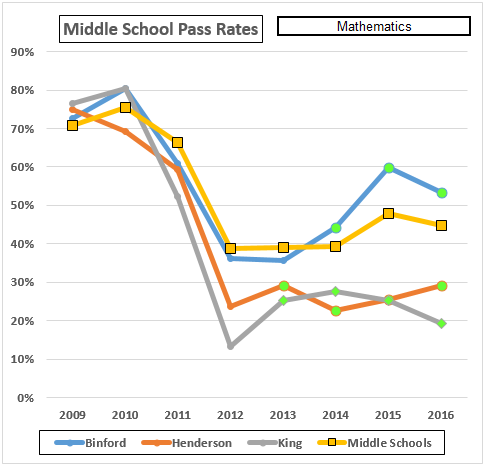 Binford again shines, here approaching accreditation level. Henderson again shows some improvement and King again is a disaster. Last, the elementary schools. The “Elem. 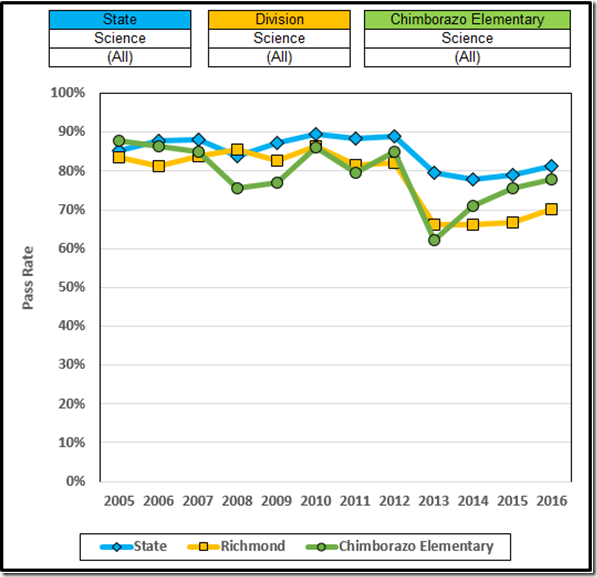 Schools” data are averages of Richmond elementary schools. 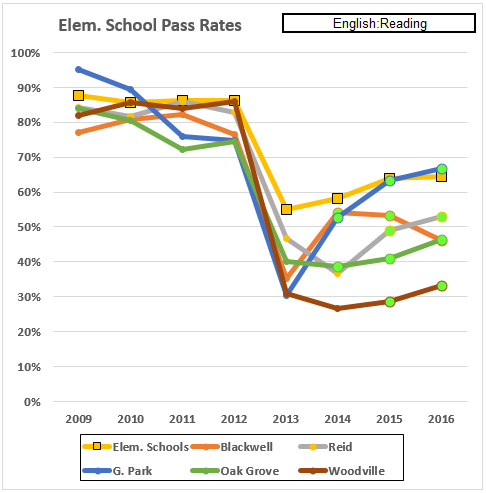 On the reading tests, Ginter Park and Reid show some nice progress; Woodville and Oak Grove hint at progress; Blackwell sags. Note that all of these performances are subpar, with Blackwell, Oak Grove, and Woodville all more than 25% below the accreditation cut line and Reid nearly that far down. 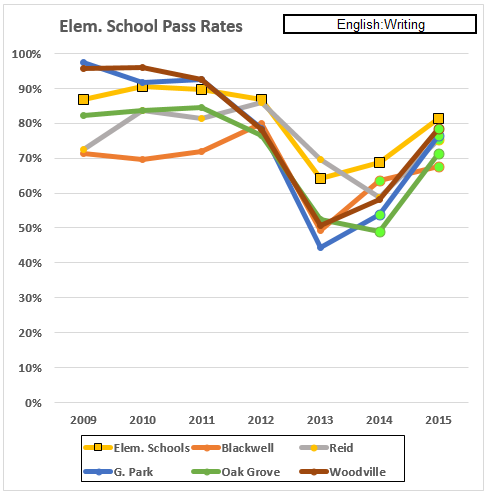 The writing data are a much happier picture, with Ginter Park, Oak Grove, Reid, and Woodville all outpacing the average and with GP, Oak Grove, and Reid now within accreditation territory. 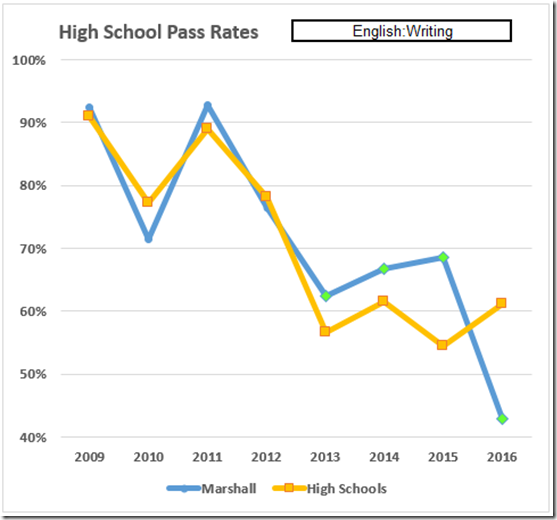 Note that the data end in 2015, when the test apparently was dropped. 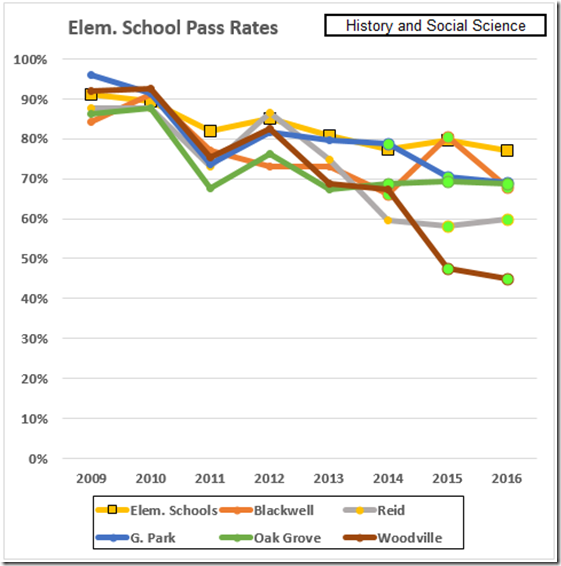 In contrast, the history & social science scores are flat, with Ginter Park and Woodville declining. 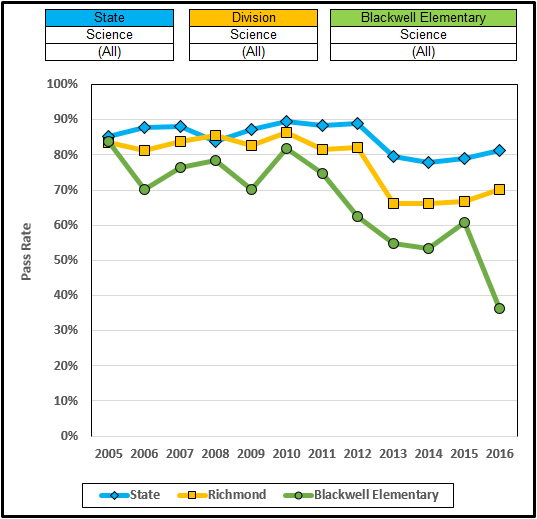 All are below the Richmond average, albeit Blackwell, Ginter Park, and Oak Grove are very close to the 70% accreditation level. 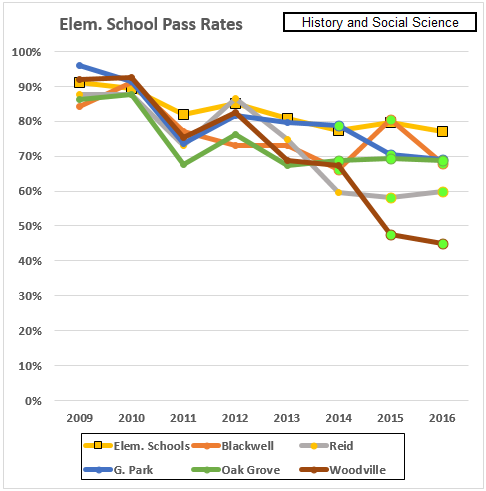 In math, Ginter Park and, especially, Reid showed nice gains; Woodville hinted at progress but remained in the dismal basement; Oak Grove showed early improvement; Blackwell rose and then sank farther. Ginter Park has been well within the accreditation range for two years. 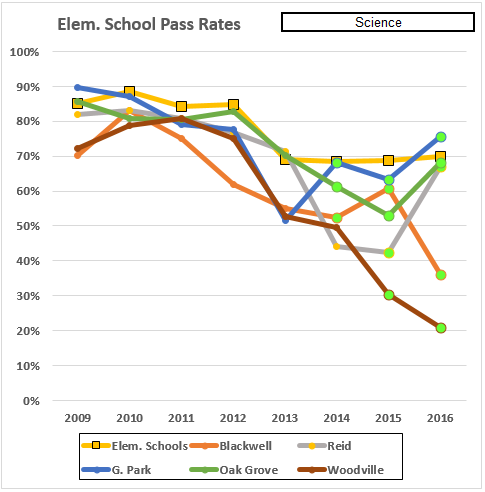 In science, we again see good numbers from Ginter Park; Reid shows big gains; Oak Grove gains after a drop; Woodville drops and remains in the basement; and Blackwell again declines. Only Ginter Park is above the accreditation cut level. What can we say in summary? Priority Status has been a waste of money and effort at Alternative and Marshall. 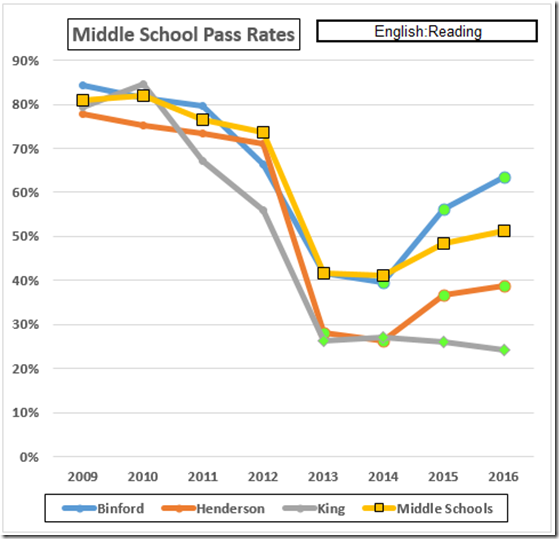 In the middle schools, Binford has been a win; Henderson, a wash; King, a dismal failure. .500 would be an exceptional batting average in the National League; here it is an earmark of failure and bureaucratic wheelspinning. Woodville was up in writing, down in history & social science and in science, with hints of gain in reading and math. Is Priority Status a success? In places. Is it a failure? In places. Has it been worth the money and fanfare? Probably not. If there is a way to fix our failing schools, especially the middle schools, VDOE either doesn’t know it or hasn’t deployed it.